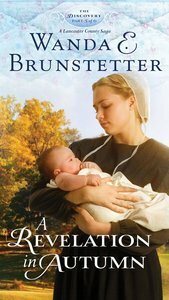 Book 5 of an exclusive 6-consecutive-month release Amish serial novel. New York Times Bestselling author, Wanda E. Brunstetter weaves a compelling love story brilliantly mingled with an unexpected twist. In part five of The Discovery--A Lancaster County Saga, Meredith Stoltzfus agrees to marry Jonah in the spring of next year. About the same time, Luke is grateful for his nurse's grandparents who kindly take him in. Maybe living in a home-type atmosphere will help him regain his memory. Can he put the pieces of his past back together and return home in time-before he loses Meredith again? About "A Revelation in Autumn (#05 in The Discovery Series)"